Members of the Canada-Africa Parliament Association on their visit to Ethiopia (photo credit: ILRI/Zerihun Sewunet). 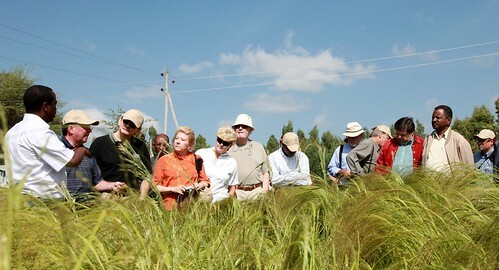 On 10–11 October 2011, six members of the Canada-Africa Parliament Association (4 parliamentarians and 2 senators) visited Ethiopia. At the request of the Canadian Embassy, the CIDA-funded IPMS project at ILRI organized a field visit to Ada’a District—one of the project’s Pilot Learning Districts. The Canadian Ambassador and the Head of the CIDA office in Ethiopia also took part in the visit. The visitors were shown a Farmer Training Center in Ude, where the project had introduced its knowledge sharing and capacity development activities using IT/audiovisual and non-IT based tools. They then visited several farmers who have adopted new technologies and have become better linked to markets for their products, including collective arrangements for milk marketing. Finally, they observed a campaign for farmers in Ude District to increase the numbers of cross-bred dairy animals through improved artificial insemination (over 100 animals were brought in by the farmers). The visitors left with the impression that livelihoods of farmers can be improved if a market-oriented development approach is adopted. Tags: CIDA. Bookmark the permalink.